Please click on the image and then use your mouse to enlarge the print. That dark, charcoal blob just to the left of the center of this print is not a blotch or mistake. It is the hair of the blue demon the warriors are trying to subdue or kill. 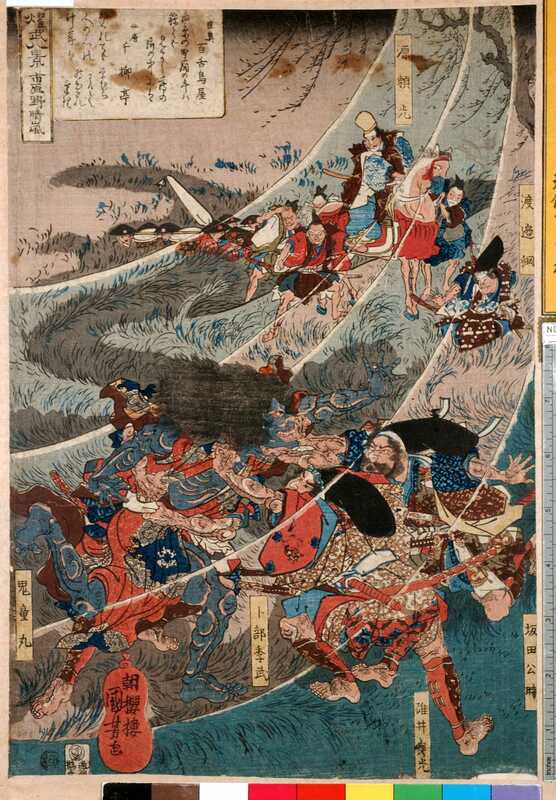 The warrior struggling in the lower center is Urabe no Suetake (卜部季武). He is accompanied by Kidōmaru (鬼童丸), Usui no Sadamitsu (碓井貞光) and Sakata no Kintoki (坂田公時). 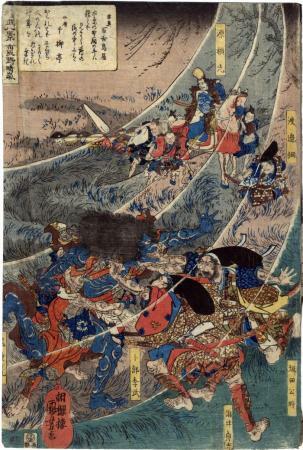 The British Museum notes that the theme of this print is actually Kidōmaru's attempt kill Minamoto no Yorimitsu. There is another related print in the Lyon Collection showing Kidōmaru revealing himself from under the hide of an oxen at Ichihara Moor. Illustrated in color in 浮世絵八華 (Ukiyo-e hakka), vol. 7 (Kuniyoshi), Heibonsha, 1985, #18.